Bhubaneswar:25/9/18: The Bhubaneswar Municipal Corporation (BMC) and International Finance Corporation (IFC), a part of the World Bank Group, organised a stakeholder workshop today to mark the completion of one year of the ‘Clean E-Bhubaneswar’ programme. Bringing together key representatives from the government, private sector, academia as well as citizens, the event felicitated 100 institutions/organisations in recognition to their contributions to make the project a success. Chief Secretary Aditya Prasad Padhi, while gracing the event as the Chief Guest, presented the awards and certificates. Among others, BMC Commissioner Dr. Krishan Kumar and Senior Scientist Odisha State Pollution Control Board Dr. Dillip Kumar Behera were present along with other senior officials from different government department and organisations. 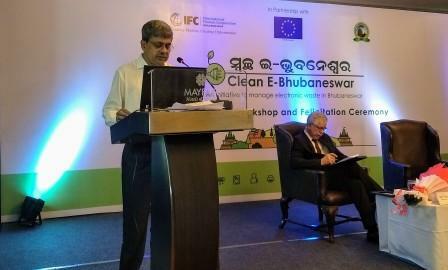 The E-Bhubaneswar programme is being implemented by IFC under the IFC – EU Eco-Cities Program. This unique project establishes a first-of-its-kind collaboration between local government entities, including the BMC, OSPCB, IT Department and the private sector to address Bhubaneswar’s e-waste management challenge by building awareness and developing a sustainable model for e-waste management in the city.